Olephant Solicitors is a City based law firm specialising in commercial litigation and employment law. Situated in the heart of London’s legal district, a stone’s throw away from the High Court, we have earned a strong reputation for high value and complex commercial claims, both in the UK and offshore. With clients from all over the UK and across the globe, we work predominantly to protect the business interests of high net worth individuals, as well as companies. Our expertise covers a wide range of issues including disputes involving contract, fraud, minority shareholders, partnerships, IP and employment issues. As trusted business advisors, our skill set has developed to enable us to advise our clients on non-contentious matters in these areas as well. Our focus is to provide our clients with exceptional legal solutions. This is reflected in our commitment to deploying the best team, with the right specialisation for each case. We understand that our people are instrumental to our business success. Without them we could not service our clients in the professional way that we do. 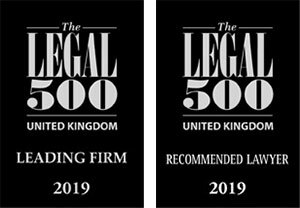 We are recognised as a leading firm for Dispute Resolution by The Legal 500.